I love wedding photos taken at Polson Pier!!! I have to say this is one of my absolute favourite wedding photography locations in Toronto. 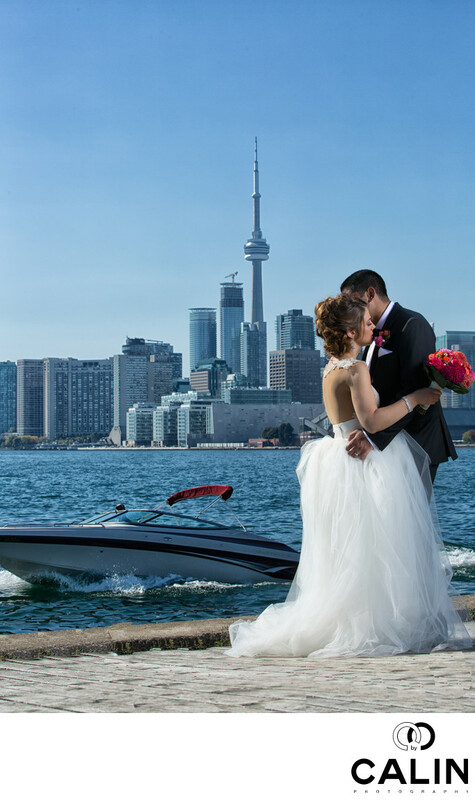 The blue water at, the splendid Toronto downtown skyline dominated by CN Tower, the planes taking off and landing at Billy Bishop Toronto City Airport and the seagulls are all elements that can help you create a photographic masterpiece. In this picture, the bride and groom hugging is not anything spectacular, but when I asked the just married couple to hug, I noticed this speed boat approaching, so I timed the shot so the racing boat was in the background. No photoshop trickery, no crazy actions or presets. Just a beautiful moment, a bride and groom, a splendid city in the background and perfect timing. This image was lit using a profoto strobe modified through a silver 7 foot umbrella!!! My assistant had a very hard time holding that in place as next to the water such an umbrella acts like a sail. To have an idea how big of a challenge that is, my assistant in this photo shoot was no taller than 5 feet. However, the couple ordered a large print and many other brides to be complimented me on such a beautifully realized image. Sometimes taking a risk brings the rewards and one can create indeed a beautiful image on the wedding day, a photo that the couple will cherish for the rest of their life. Location: 11 Polson St, Toronto, ON M5A 1A4, Canada.